1, Powerful, uniform brightness, composed of 160 high-brightness LED lights, the maximum bright effective coverage of up to 6 meters. 2, Energy efficient, less heat consumption. 3, Four condenser plates and lamp cups effectively collect light to avoid light waste. 1, LED lamp life of more than 30,000 hours. 2, Hot shoe connecting rod adopts high-efficiency cut-off engineering plastic to eliminate user's concerns. 1, Support for many types of common batteries, and can test the battery power. 2, Automatic switching 5th battery and lithium battery function. 1, Small size, compact structure, easy to carry. 2, Low power consumption, longer use. 3. Suitable for different levels of weak light situations. 3, Do not allow water or other liquids to enter the product during use to avoid internal short circuit. And damage the product. 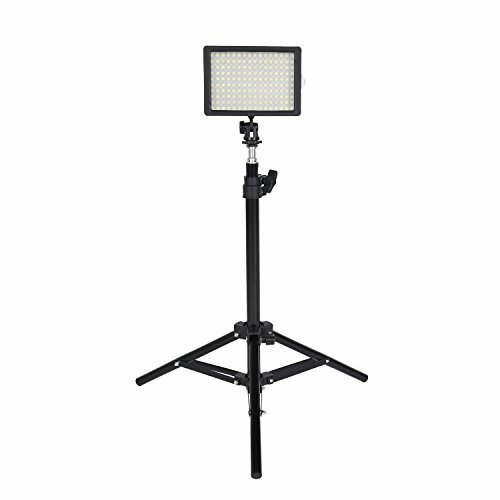 ENERGY-SAVING 126 LED VIDEO LIGHT: Constructed with 126 pieces energy-saving LEDs with long life span (up to 50000 hours) for photographers to get perfect light.Lamp position: 16 levels of dimming. Designed with standard hot shoe plug, it can mount to any standard hot shoe on most DSLR or digital video cameras as well as tripods and light stands equipped with a hot shoe mount or 1/4" thread. Suitable for wedding photography, indoor photography, news live photography, birthday parties, KTV photography, night club photography, bar photography and other weak light situations. If you have any questions about this product by Cozyvie, contact us by completing and submitting the form below. If you are looking for a specif part number, please include it with your message.